For children's book lovers I'm about to say something that appears to be sacrilegious. I said it once before one Twitter and I believe my fellow book chatterers were flabbergasted. And I'm going to put it out here again: I do not like the children's classic Goodnight Moon. There I said it. I just don't get it. It's weird. The story is weird, the illustrations are trippy and the colour-scheme is garish. 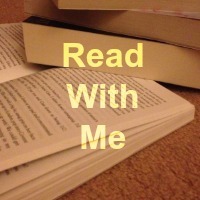 It is not the book for me, that's for sure. And please don't be offended if you love this book - I'm sure there are some books in my collection that I adore that others don't like. There is certainly room on the shelf for lots of differing opinions! But I have discovered a few lovely alternatives for little lunar lovers. This is a very special book that is the perfect bedtime read. Before I tell you anything about the insides, let's talk about the unique cover. It features a huge moon with the silhouettes of a family of rabbits in front and the moon lights up at the push of a button. It's seriously enchanting for little ones and BookBairn adores playing with it (especially just before bedtime when it gets dark). Inside are similar silhouettes set against beautiful nighttime scenery with a large moon featured on each page. As you join the rabbits on their nighttime hop-abouts through the woods and join them in gazing at the moon you will soon notice that the moon changes shape. The phases of the moon are discussed over the course of a lunar month by the rabbit family giving children a gentle and simple introduction to the phases of the moon. The text is written in simple poetic prose making it a delightful bedtime read. This is such a charming book, little ones will be asking for it time and again at bedtime (especially now when they can really see the phases of the moon because it is actually dark at bedtime!). If you want to know a little more about this book I'll link the advert here (yes, some books have video adverts - who'd have thunk it?!). I have wanted one of David Litchfield's books for a long time - they are absolutely beautiful - but I felt many were a little long for BookBairn and this one probably is too though we are growing into it! 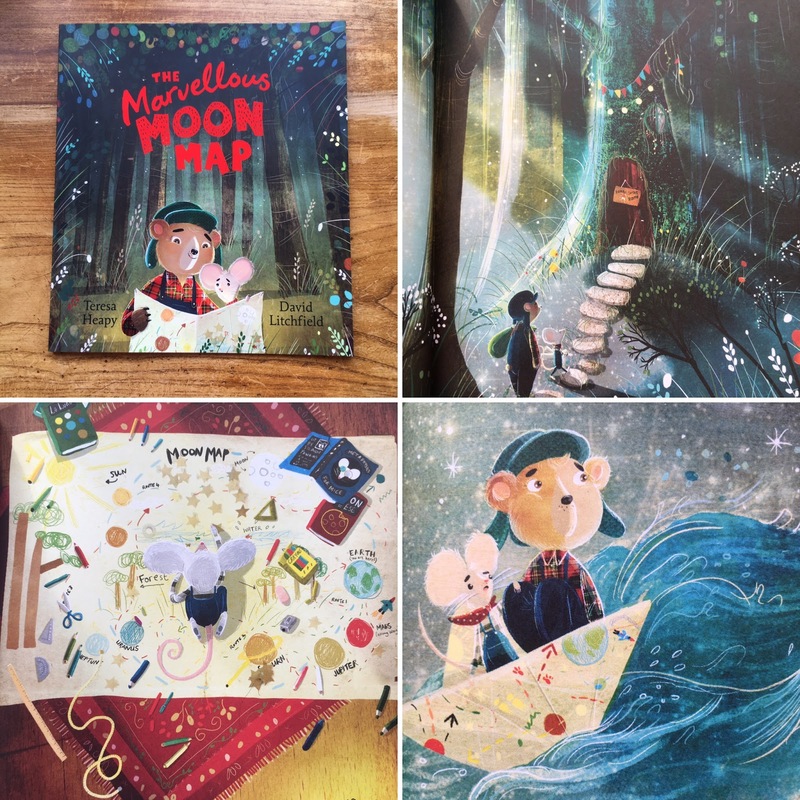 It tells the story of Mouse, who sets off on an adventure to find the moon with the Marvellous Moon Map that he has created. But his worried friend, Bear, follows along too and appears to Mouse's aid just as it begins to get dark and creepy in the woods. Mouse can't seem to find the moon but Bear has a good idea of how they can put the map to better use. 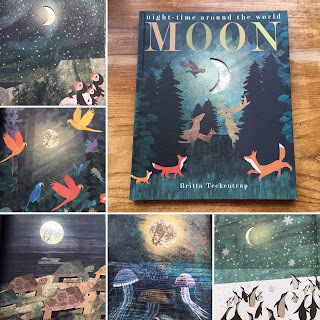 The illustrations in this book are truly stunning and I look forward to reading this one for bedtimes to come. 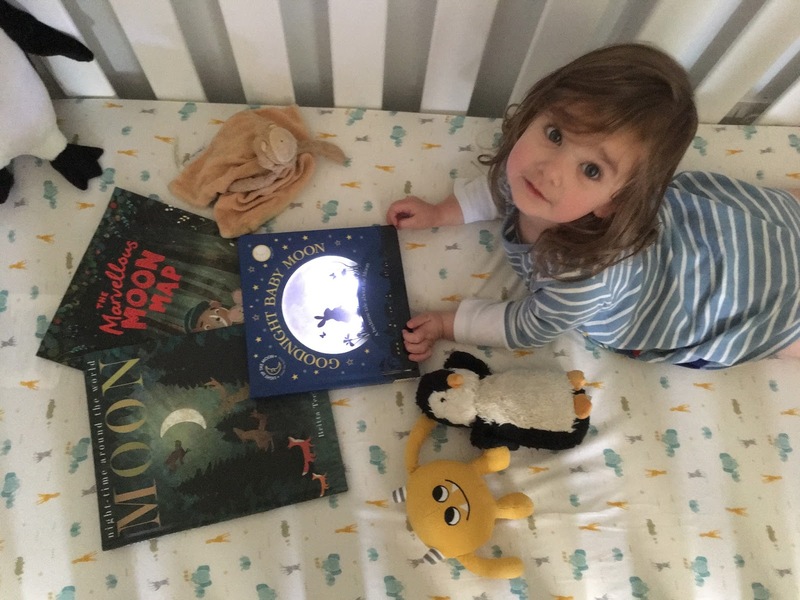 "For BookBairn, there is, without a doubt, nothing more important to her when reading books than the illustrations. She feels them, touching the pages, she pours over them turning page after page after page. She can't read the words. And as much as she enjoys listening to stories read aloud to her, it's primarily the illustrations that determine her favourites." And I think this is probably true for us grown-ups too! 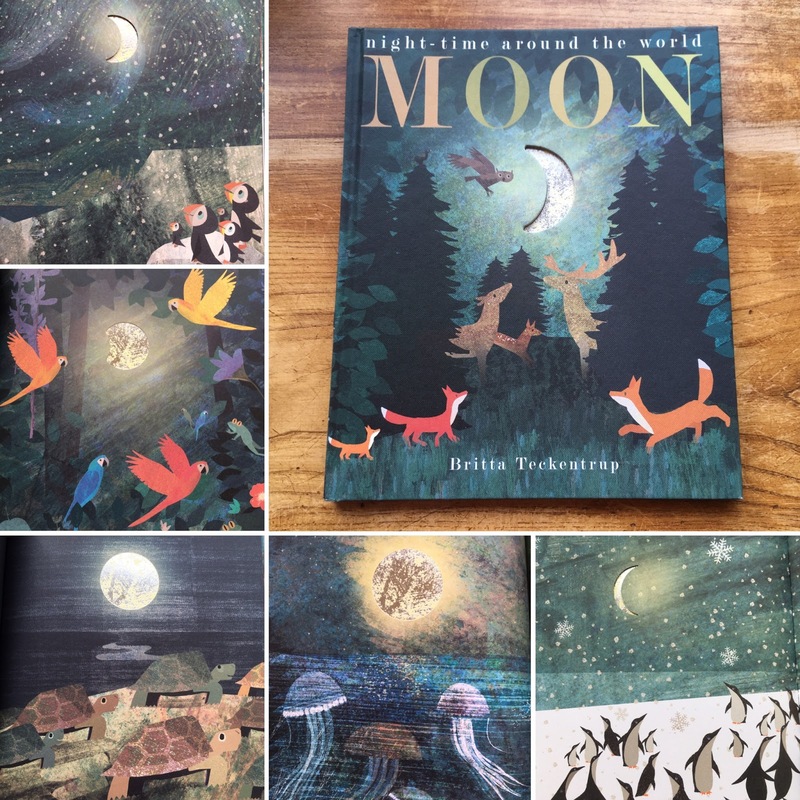 'Moon' is an atmospheric book that will take you on a journey through the dusky peek-through pages under the light of a shimmering moon from woodlands full of night-time creatures, to antarctic skies, to sunny beaches and to (my favourite) the northern lights. Featuring animals as diverse as jellyfish, turtles, bears, penguins and puffins to name a few, this really is a mesmerising book. 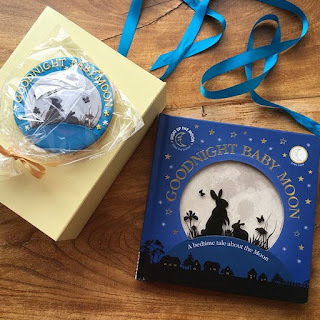 The die-cut pages means that little ones can see the shape of the moon change before their eyes. The rhymthical text of Patricia Hegarty should not be forgotten amongst the stunning artwork as it too is beautiful. But mostly this series is intricate, innovative and incredible! This really is breath-taking. And if you don't want a copy for your kids - make sure to get one for you! These three books all make beautiful bedtime stories - far more magical than the aforementioned Goodnight Moon. 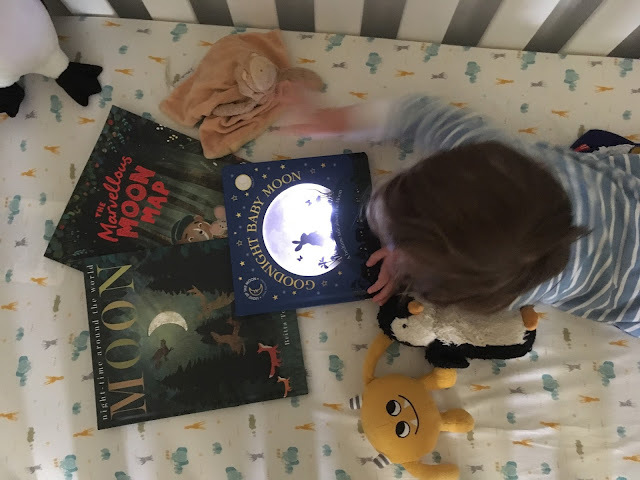 The moon and nighttime sky really holds a true fascination for little ones and these books certainly capture it's magic! 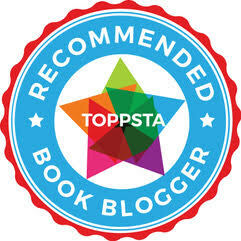 *Disclaimer: these books were sent from the various publishers for free for review purposes. Words and opinions are our own. BookBairn picked The Marvellous Moon Map to read before bedtime not long ago with me and we got to the end ok. She really enjoyed it although I’m now wondering if she picked it to put of bedtime a little longer. That's good! She's becoming quite adept at delaying tactics for bedtime! Thanks! Nice to have someone who agrees! It's hard to resist all the fabulous books being released at the moment!